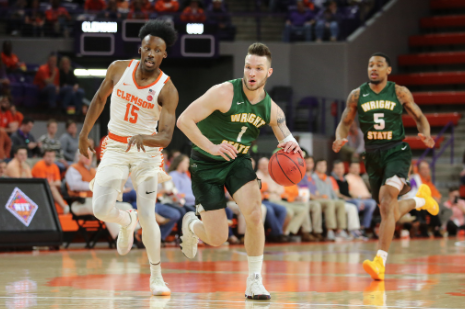 The Wright State men’s basketball team played in its first-ever National Invitation Tournament (NIT) Tuesday night at Clemson, pushing the ACC team but falling 75-69. The Raiders end the season at 21-14. The back-and-forth game saw five ties and 10 lead changes as WSU was led by five players in double figures with Bill Wampler on top with 17 points. Loudon Love ended with 14 points and nine rebounds as Cole Gentry had 13 points, Mark Hughes 12 and Skyelar Potter 11. WSU shot 42% from the field and battled on the boards as Clemson led 35-32 in rebounding. The Tigers had nine blocks but the Raiders committed only nine turnovers. WSU’s bench outscored Clemson’s bench 30-6. Wright State hit 10 three pointers, shooting 40%, as Clemson had eight. Clemson jumped to a 4-0 lead early, but Hughes hit a 15-foot jumper to get Wright State on the board. Down 16-2, Love hit a wrap-around layup, followed by two free throws by Wampler with a three from Hughes to make it 19-9 by the 12-minute timeout. WSU continued to cut into the lead with a field goal from Wampler and a three from Potter to make it 22-16. Potter hit his second three and added a layup off his own steal to make it 27-23 by the eight-minute break. Potter’s hot hand continued as he hit a free throw to draw the Raiders within one. It was a Wampler three that tied the score at 29 with 4:08 remaining. The Raiders grabbed the lead on an inside layup from Love, erasing a 14-point Tiger lead. An up and under basket by Hughes gaveWright State a four-point advantage, causing a timeout by Clemson with about one minute left. WSU took the lead with a 7-0 run but the score at halftime was 33-33. The Raiders was led by Wampler and Potter with nine points each, seven from Hughes and six from Love. Hughes grabbed five rebounds with four each from Love and Potter. The Raiders shot 48% from the field to 45% by the Tigers as Wright State outrebounded the ACC school 17-15. Down 16-2 early, the Raiders outscored Clemson 33-15 to go up four points with 1:41 remaining. The Raider bench accounted for 20 points in the first 20 minutes. Clemson grabbed the lead but the Raiders came right back to take a four-point lead at 43-39 off Wampler’s second three. Wright State went up 47-41 to make it a 20-point swing and giving the Raiders their largest lead on an offensive rebound and five footer by Love. A series of threes gave the Tigers the 51-50 advantage, two from Clemson and one by Cole Genty. Two straight layups from Love got the Raiders within one again at 57-56 at 7:15. Out of the break, Wampler rattled home a long three to help the Raiders to a 59-57 lead but Clemson answered with a three to grab back the advantage at 60-59. After a WSU timeout, Gentry hit a three asWright State went up 62-60. Under four minutes on the clock, Clemson hit three free throws to once again take the lead 63-62. Out of the media timeout, the teams traded baskets capped by a Hughes triple for the team’s 10th of the night to cut it to 68-67. Gentry pushed the gas for an easy layup to make the score 70-69 with 1:30 left. The home team made one more from the field to make it 72-69, going into the final minute. The Tigers made five free throws in the waning seconds to win 75-69. Gentry was strong in the final period with 13 points on three threes and six rebounds while Wampler added eight points. Wright State shot 38% but the Tigers hit baskets at a 52% average and held a 20-15 rebound edge.